Wherever we go, sounds are all around us: the crunch of our footprints in the snow, the sound of birds singing, rain falling, every gentle breeze or our own heartbeat. The entire world consists of acoustic stimuli. They play the entire keyboard of human emotion. It is obvious that even these natural sounds have a vast effect on people. Man-made sounds are everywhere too. Just think of your alarm clock, your ringtone, the television or traffic sounds. The topic becomes especially interesting when we consider the messages man-made sources of sound transmit: Does the noise the car door makes when it shuts sound sporty or comfortable? How should a butter cookie crunch in the mouth to reinforce the fresh taste? More than enough reason for devoting a topic area to acoustics in architecture. Join us as we take a look into the future. Get up to speed with the current state of technology and find out how D+H solutions set new standards. About acoustic ventilation control. Guest article by Dr. Leistner, Professor and Head of the Fraunhofer Institute for Building Physics. No modern building can go without automation. Smart buildings already control every imaginable feature to increase the safety, security, efficiency, comfort and convenience of inhabitants. Windows that open automatically when fresh air is needed are a good example. However, windows not only serve to let air and light into a building, but also to keep noise out. However, soundproofing is still given short shrift in today’s architecture, as it neither saves energy nor promotes greater safety and security. However, this does not at all mean that we can neglect it. Noise is one of our bodies’ greatest stress factors. Our health is damaged not only by literally deafening noise levels, but also by the continuous sound level that attacks our psyche. It robs us of needed rest, concentration and ability to perform. An adequate supply of fresh air and a pleasant soundscape are therefore equally important for our environment and quality of life. However, the technology plays a crucial role here. What happens if the window opens automatically to provide ventilation just as a car goes roaring by? Or a train passing outside is considered more unpleasant than the stuffy atmosphere inside? In the worst-case scenario, the window is closed again manually and the automatic system is disabled. To prevent this, automated technology has to become even more intelligent. This requires bringing soundproofing and window ventilation into harmony – through an automatic system that takes into account both room air quality and outside, temporary noise events and decides whether to open or close accordingly. This is made possible by the interplay of motors, sound sensors, traffi c and noise information and an intelligent control system. The important feature is that a human being still has the last word and can confi gure the entire automation set-up individually. However, devising a solution that is up to the task requires well-thought-out answers to a variety of design-related, technical, acoustic and psychological questions. Which types of noise exist in the first place? How can noise be measured and integrated into the control system? And how do users respond to the overall system? The answers can be used to develop prototypes. This requires science as well as an innovative company with far-reaching vision. 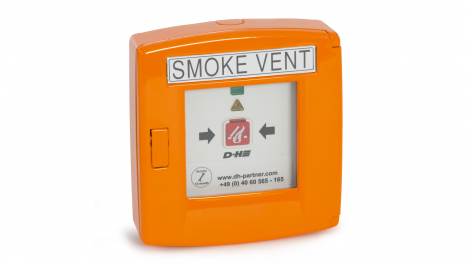 D+H’s expertise with intelligent ventilation systems has proven invaluable here. To give just one example: What is the benefet if closing a window is louder than the unpleasant noise outside? 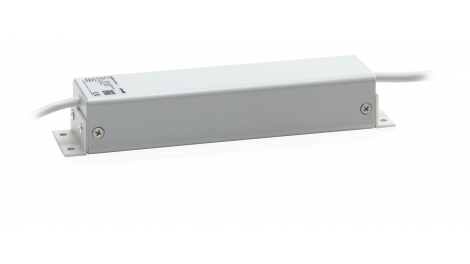 As a result, we have integrated the CDC-0252 chain drive from D +H in our trials. Decoupling the drive from the bracket attained a signifi cant noise reduction in the drive. Since 1960, the Henninger Tower has defined the face of Frankfurt. Whether due to the unmistakable keg at its peak or the famous bicycle race in the neighbourhood, the Henninger Tower was part of the culture of Frankfurt. With the construction of a new Henninger Tower, the city is now regaining an emotional landmark and important element of its urban character. The project included innovative ventilation solutions from D+H. Frankfurt's signature landmark, the Henninger Tower, is being reinvented. In Spring 2017, a landmark residential tower is opening on the site of Henninger Brewery's old grain silo. It is slated to reach a height of 140 metres, making it one of Germany's tallest. It will also be one of the most convenient. A ventilation system that encompasses all of the building's 200 apartments ensures replacement of warm, stale indoor air with healthy outdoor air. The extremely efficient system provides fresh air only where necessary and in the amount needed. This not only improves room hygiene, it ensures an unparalleled atmosphere of wellness. Of course, this also includes the four apartments with a 360° view in the "keg". Challenge of the urban environment. Long before the installation, teams from D+H participated in project planning. The great challenge: A municipal building code stipulates that an entire ventilation sash has to close automatically at precisely 10 p.m. and whenever winds are strong. Renowned Frankfurt-based architectural bureau MEIXNER SCHLÜTER WENDT approached D+H with this challenge. As if this were not enough of a challenge, an additional problem was added. What would happen if someone had his or her hand in the window gap at the exact moment the ventilation sash closes at 10 p.m.? This is where Dr. Karlotto Schott enters the picture. The façade engineering expert runs a consultancy that advises clients and architects in design-related structural engineering and economic matters. The Henninger Tower construction was one of these projects. Dr. Schott recommended the use of sound-absorbing windows. They are opened in a parallel position and guide the air – and the noise along with it – into the room's interior like a labyrinth. This cuts the noise to a maximum of 35 dB while the fresh air streams in slowly and evenly. Hot and sweaty work on the "Frankfurter Fass". A heat and presence sensor would be able to simply detect whether anything is in the way. Dr. Schott was thinking of his grandchildren. He knew that they like to put their hands into gaps and openings. He wanted to be on the safe side – and eliminate all sources of potential malfunctions. What would happen if the room temperature were exactly the same as a person's body temperature? Would it still know that the window must not close? The only way to find out was to test the function of the sensor. This meant hot and sweaty work for all involved. For the experiment, a room in the "keg" was heated to 36 °C, roughly body temperature. While the outside temperature hovered around 5 °C, the experiment room was converted into a virtual sauna. The architects, construction planners, TÜV experts, D+H employees – and, of course, Dr. Schott – then took the heat, as it were. Experts from the TÜV who were on site likewise had to sweat a little. At the end of the experiment, everyone had lost some weight, but gained a great deal of valuable empirical knowledge. The sensor keeps what it promises. D+H CDC Series chain drives work in undercover conditions. 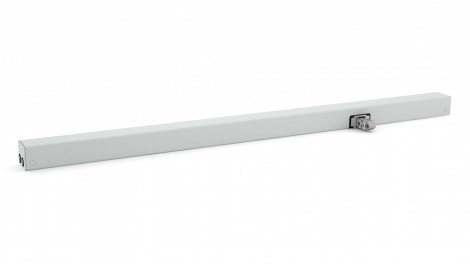 Their narrow, compact design makes them fit into any window profile – and their quiet performance makes them almost inaudible. They master even the most difficult window sashes with ease. The drive's silence relies on an idea that is equally simple and effective. The basic idea: Where metal meets metal, things get loud. Drives are no exception. Considering that the human ear perceives a difference of 10dB as being twice as loud, it is clear that even small improvements can mean tremendous progress. For this reason, D+H decoupled the drive's mechanical system and the brackets – reducing sound emissions by a factor of 5. The result: The new D+H CDC-0252 is the quietest revolution in drive engineering ever. The additional decoupling of both brackets significantly decreases the foundation forces in the entire frequency range. The noise scale shows the loudness levels of various situations. Increasing the sound pressure level by 10 dB is perceived as doubling the noise.